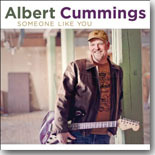 In his liner notes for Someone Like You (Blind Pig), Albert Cummings writes, �this record is straight-ahead real from the first note.� That first note signals that this is going to be an exciting ride. The opener, "No Doubt," is a whirlwind of electric guitar mastery. This is a man who deserves a much larger stage. Tough, Texas-style ala Johnny W or SRV, but clearly his own man on his own mission. The Massachusetts-born Cummings deftly combines explosive power with subtle nuance. Produced by David Z (Buddy Guy Prince) and featuring a dream band of bassist Reggie McBride (Stevie Wonder, Herbie Hancock), drummer Tony Braunagel (Bonnie Raitt. Taj Mahal), and organ maestro Mike Finnigan (Raitt, Taj Mahal, Etta James), it is Cummings� most impressive effort to date. The all original dozen assembled here have the capacity to bowl the listener over and entice you in. Guitarist Jimmy Vivino guests on "I Found You," "Little Bird" and "Meat Locker." The work on the latter two is exquisite, conversational and articulate. "Meat Locker" is a two-guitar attack in a style that reminds of Albert Collins meets Jeff Beck. Finnigan burns on B3 and the rhythm team is hard driving. "Finally In Love" is a joyful song with the great Teresa James on backing vocals. "I�m In Love" features a lopey and fun lyric and subtly burning guitar work (�I want to do things to you to put a smile up on your face�). "Movin On" is swampy. Tony Braunagel on cymbals and a way funky solo from Mike Finngan compliment Cummings� chugging. "Make Your Mind" shows the SRV influence strongest and begs for an 11 on the volume control. Cummings says that these are generally all first takes with no tweaking. That makes this all the more impressive. For electric volume guitar you�ll find nothing as impressive. All contents Copyright � 2015, Blue Night Productions. All rights reserved.